Looking for a portable 120" TV? If so you're in luck. 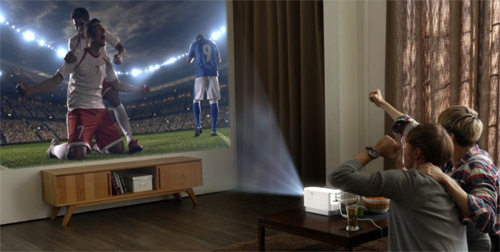 LG's newly announced ProBeam Laser Projector -- Model HF80JA for home theater combines a smart TV with a full HD 1080p projector, and puts it all into a package weighing less than 5 lbs. Rated at 2000 lumens and priced at $1,499.99, the Probeam HF80JA is expected to be shipping in March. Light weight -- 4.6 lbs. Wireless support for Miracast, WiDi, and DLNA; connects with iOS and Android devices. s/PDIF optical audio out; wireless Bluetooth out. LG Electronics offers several projectors with built-in TV tuners including the popular ultra short throw LG PF1000U that was released last summer and is reviewed here. Effectively these are TVs that use a projector as the display. The ProBeam HF80JA's 2000-lumen rating makes it the brightest one yet, and double the brightness of the PF1000U. Even better, along with the brightness it offers a long list of connection options and not just a TV tuner, but LG Smart TV features, including Netflix support. One big difference between the new ProBeam Laser Projector HF80JA and the PF1000U is that this is a standard projector with a throw distance of up to 12 feet depending on the size picture you want. From a distance of 8 feet it will give you an 80" diagonal picture, and from 12 feet a 120" picture. Its 1.1x zoom lens helps you zero the image in on a screen, but does not give much leeway in throw distance for any given screen size. At $1499, the LG ProBeam HF80JA is one of the least expensive laser projectors we've seen in any category, much less home theater. One important hedge is that we don't expect to measure it at 2000 lumens. 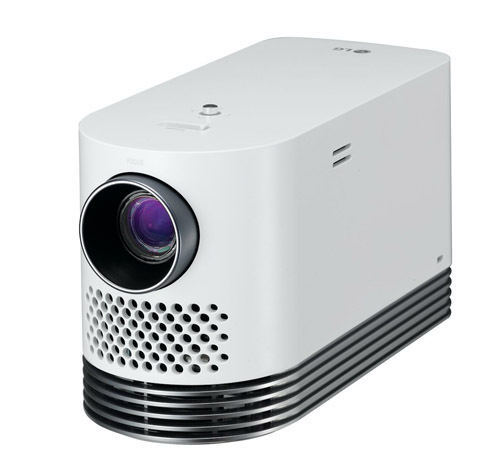 The rating is based on perceived brightness, which LG says is equivalent to a 2,000-lumen projector with a standard lamp. That said, based on LG's equivalent brightness claims for some of its earlier models, we expect the HF80JA to throw a big enough image--potentially 120 inches in moderate ambient light--to dwarf any comparably priced big-screen TV. The combination of brightness, built-in TV, laser light source, and price make it a unique offering, and one we look forward to reviewing. Really interesting... Any info about lens (plastic or glass)? I contacted LG and asked about the 3d specs, if any. I received a reply that said my message had been forwarded to another dept. since they did not have any specs as far as 3d was concerned. I was told to expect a response in 2-3 days. that was about 10 days ago. LG has not responded yet with any info. regarding 3d and if it will be supported at 1080P. 3d is dead now.I can not wait to see the review for this. If 3D is dead why aren't all the 3D blu-rays on sale at amazon or anywhere else? This product has a Rainbow effect.